The 4570 Protective Coverall by 3M is certified to Type 3, 4, 5 and 6 levels of protection and offers proven resistance against radioactive particles and infective agents, adhering to EN 1073-2 and EN 14126 standards respectively. 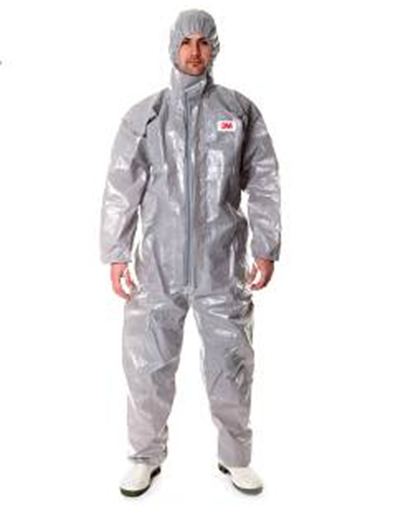 Designed to offer a high level of defence against liquid chemicals, the coverall features a soft anti-static inner layer for comfort, combined with multiple outer layers of polyethylene laminate. All seams in the garment are strengthened with a five-layer protective tape to provide a highly-effective barrier to liquid chemicals and hazardous dusts, while the coverall also features two stormflaps with double colour-coded zips for extra protection. Nikita Shah of the Personal Safety division of 3M commented: "The 4570 Protective Coverall achieved the highest class performance on all tests under EN 14126, however we also ensured the coverall remained a comfortable, easy-to-use garment.